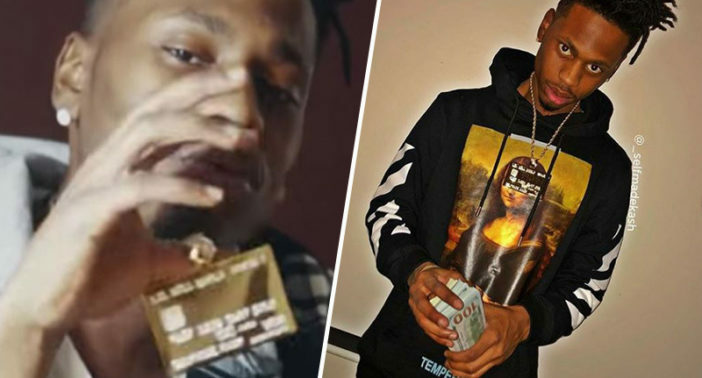 A rapper from Detroit who was known for wearing a bejeweled credit card as a pendant is now facing several credit card theft charges. 25-year-old Jonathan Woods – better known to his fans as ‘Selfmade Kash’ faces charges of wire fraud and aggravated identity theft as well as the possession of unauthorized access devices. Woods, who has over 36,000 Instagram followers, has previously described himself as the greatest ‘swiper’ of all time as well as the ‘GOAT’, often boasting about his alleged acts of credit card fraud. The rapper would often upload videos and photographs displaying cash, credit cards and credit card skimmers, accompanied by hashtags such as #ScamLikely and #dumpswithpin. Woods would also make frequent use of the credit card emoji. Woods would allegedly sell information on the dark web about how to commit credit card fraud, with people contacting him through social media, as reported by ABC Denver. Speaking on Detroit talk show The Stewe Show, Woods compared credit card fraud to ‘art’ and did not appear worried about the prospect of getting caught. A lot of people come to me saying, like, bro, you gonna get indicted! But, you know, they don’t know what I got going on. You feel me? They don’t know what I’m doing. I feel like I’m way smarter than a lot of people. … I know how to do this. Jonathan Woods claimed to be sophisticated at credit card fraud when, in fact, he is not. It was … part of the scheme and artifice to defraud that the defendant, Jonathan Woods, sold his purported expertise on how to conduct credit card fraud to people over the Internet, such as what BINs to use when, in fact, the information was worthless and many of the BINs were nonexistent. Woods had reportedly been charging people between $400 and $600 for this worthless information. If convicted of these charges, Woods may face up to a 20 year prison sentence.